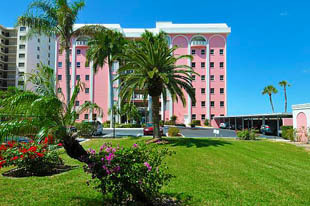 Flamboyant with its coral pink exterior, Le Chateau condominium in Sarasota, Florida, surely is among the standouts among the Sarasota real estate developments in its neighborhood. This condo community is composed of twenty-seven residences located at 37 Sunset Drive near the city’s downtown area. The French provincial architectural style of this mid-rise residential building further sets it apart from other nearby condos which include the luxurious Ritz Carlton. The Old World ambiance that this condo exudes is a very apt complement to the splendid panorama it affords to its residents. The magnificent views of Sarasota Bay here are unobstructed, and during special events or occasions, the homeowners can practically have ringside seats on such as activities as the Christmas boat festival, powerboat competitions, and inshore sailing regattas. Most of the creature comforts of a waterfront community are provided in this condominium complex. Besides the comely lobby, there is a guard house to secure entry to this gated community. The condo residents also have access to elevators, a fishing pier, covered parking spaces, and a swimming pool, among other amenities. Cross ventilation and laundry facilities are provided, and there is a separate storage building. Furthermore, hurricane-proof roofing has been installed in the building which was also re-coated with waterproof paint. A search Le Chateau condos for sale can produce choices of one-bedroom to three-bedroom units with floor spaces ranging from around 800 square feet to about 1,500 square feet. Option for the one-bedroom, 805-square-foot condos for sale at Le Chateau can have a list price in the $300s. List prices of Le Chateau condos for sale can also reach the $765,000 level for a three-bedroom, 1,514-square-foot unit with a great view of Sarasota Bay. The proximity of these residences to the Sarasota downtown provides a lot of blessings. Le Chateau residents are close to many of the city’s famous hubs for arts, culture, and entertainment. In particular, these include the Sarasota Opera House, the Ringling Museum of Arts, and the Golden Apple Dinner Theater. Many of the city’s charming restaurants, like the Bijou Café and Ceviche, are also only blocks away from the community. Refreshing leisure activities can likewise be provided by nearby parks like the Bayfront Park and the Centennial Park, both of which are also located adjacent to the Sarasota Bay. For shopping, the downtown choices are supplemented by those options at the St. Armands Circle only a short trip across the Ringling Bridge. This span also leads to other lifestyle delights at Bird Key, Lido Key, and Longboat Key, storied places that further enrich the good life at condos like Le Chateau in Sarasota, Florida. 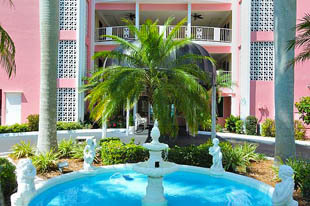 Below are all of the current condo listings available for sale at Le Chateau condos of Sarasota.